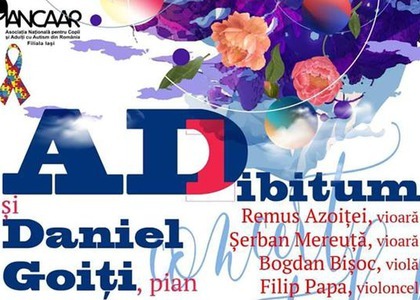 Mister Filip Papa, on the 1st of April, your chamber orchestra and pianist Daniel Goiți are holding a recital in the second edition of 'Blue Harmonies'- an event for autistic youth and children. Could you tell us more about this event? What's its purpose? In this project, our role is bring together the public and the music lovers and those who want to give a helping hand to these children. ANCAAR is The National Association for Children and Adults with Autism in Romania. The event is part of the 11th campaign, which precedes the World Autism Awareness Day. We named it 'Blue Harmonies' two years ago, but I've been raising funds for different charities for about five years now, and now I'm doing it for this cause too. Every time data is published about how much this association helps the cause. Together with pianist Daniel Goiți we'll be performing Brahms's Quintet for Piano and String Quartet in C Minor, hoping that our combined reputation will bring more people to this concert. You'll be performing 'Quintet for Piano op. 34' by Johannes Brahms, considered by some to be the culmination of Brahms's chamber repertoire. Is there a particular reason you chose this work in the context we've just mentioned? This year we chose this quintet because it has a special meaning in the sense that it's very emotional, bringing both drama and the joy of life; I think that this is, indeed, what are we talking about when it comes to autistic children. You've got a tight schedule next week; besides the recital you are holding in Iaşi, you are performing another two concerts at Sala Radio - on the 3rd of April, as soloist, and on the 4th of April, a chamber music concert with Ad libitum Quartet as well. What can you tell us about the program for these concerts? It's a pleasure for us to be on the stage of Sala Radio, because after this concert, the first cellist of this quartet - Remus Azoiței - is performing a concert with the National Orchestra on Friday. As a soloist I will be performing Variations on a Rococo theme for Cello and Orchestra by Pyotr Ilyich Tchaikovsky. As for the concert on the 4th of April, the quartet and I chose a program which starts from the first quartet composed by Haydn, op. 1 No.1, which is splendid, followed by an early quartet by Mozart; after the break we'll play a symphonic quartet - the Quartet No. 1 in C Minor by Johannes Brahms. What comes next for Ad libitum Quartet? That would be our next concerts we are performing at the Iaşi Philharmonic. We are part of a project, which we are still figuring out, named the Quartet Integral of Johannes Brahms. The Ad libitum Quartet and I are preparing our performance for the 'George Enescu' Festival, me as a soloist accompanied by the Iaşi 'Moldova' Philharmonic Orchestra. Then we'll have a concert in Iaşi with the quartet, and then we'll be leaving for London on the 3rd of October.